French MP and environmental activist Nicolas Hulot is planning to ban dozens of single-use plastic objects in France by 2025, in a bid to replace them with biodegradable alternatives. The government has set itself the objective to have “zero plastic thrown in the oceans by 2025”, after recent reports estimated that 10% of single-use plastics end up in the sea. These include everyday objects such as straws, cotton swabs, plastic cutlery, and cotton buds, which can cause damage to marine life and ocean ecosystems. Mr Hulot’s “battle against plastic” comes as the movement gathers force around the world. This month, coffee giant Starbucks announced that it would eliminate single-use plastic straws by 2020, and just today, also confirmed that it was working with fast food leader McDonald’s to develop a recyclable, sustainable takeaway coffee cup. It also said that in many countries, it had added an extra charge to paper cups to encourage consumers to bring their own reusable containers. Many companies across the world are starting to ban single-use plastic too, including Carrefour, Lidl, Costa Coffee, Marriott International, and Ikea. Recently, 25 global investors have brought together billions of dollars in investment to put pressure on global giants Nestlé, Procter & Gamble, Unilever and PepsiCo, to encourage them to reduce their plastic packaging and stop using single-use items. Some alternatives to single-use plastic items are already available in France. Plastic straws can be replaced with paper or metal alternatives, and cotton buds with plastic handles can be replaced with cardboard versions. Breton company Algopack has also become one of the first in France to work on technology using algae to replace plastic. Algae, which is described as an “almost infinite resource”, can be used to create a 100%-natural material that looks and behaves similarly to normal plastic, and can be sold for a similar price. Crucially, it decomposes in 12 weeks on land, and just four hours at sea (compared to two hundred years needed for normal plastic). 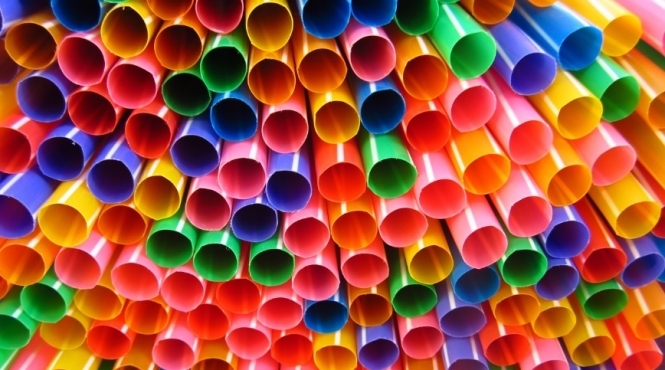 Another French innovation has recently included a group of lycée students from Strasbourg who have created a range of “plastic” straws called Popstraw. The straws are made with biodegradable starch, and the group is hoping to bring their concept to market soon.